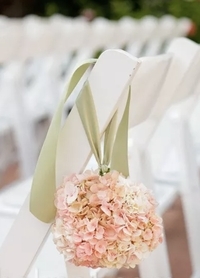 This grand Delphinium Spray is a whopping 5' 6" long from end to end and the Cascading Blush Pink and Ivory Silk Flowers make event planners eyes pop! 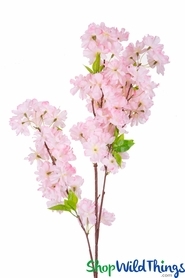 Each flower is about 3 1/2" wide and the delicate pink tipped petals fading to ivory in the center make this spray soft and dreamy! There are 2 dangling sprays made of super premium silk and each is 4" wide. With the 2 sprays together, the width is a total of 6" but you can spread them out to 24"! One hangs down 36" and the other hangs down 25". The impressive stem is 26" tall by 1/2" wide and there's 4" of stem sprouting green leaves. Standing the spray straight up, it is 34" tall. Simply use a Clear Glass Vase to create spectacular centerpieces or floor Decor. 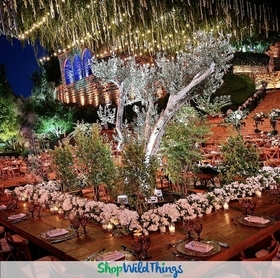 Cascade from a wedding arch or place in the holes provided on top of a Wedding Pillar Column and let the showy blooms tumble down. Easy yet fabulous! 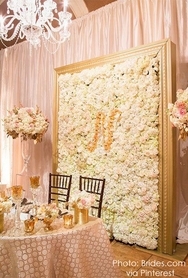 Mix with Flower Walls and Panels to create an incredible photo shoot backdrop or to highlight the head table. Versatile, affordable, exquisite and sophisticated. we're proud of our ever-growing selection of quality silk florals and feel confident that you'll be proud using them to create memorable floral designs!